What is Audibles on the Fly? Audibles on the Fly is a feature that allows users to change any formation audible from the Play Call screen at any point in the game. 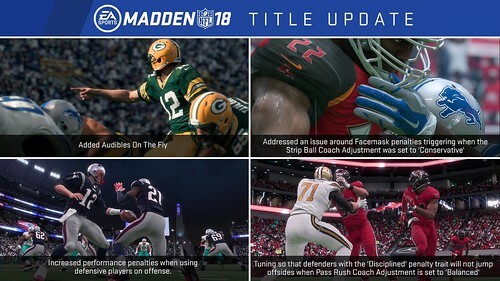 This feature will bring a level of strategy to Madden that you see from the best players and coaches in the NFL by allowing users to change up their scheme or game plan mid-game to make “on the fly” adjustments to counter your opponent's scheme. This feature also introduces custom audibles in modes like Madden Ultimate Team for the first time ever. To access the audibles on the fly feature, you need to be selecting plays by formation when at the Play Call screen. Pro Tip: Any play that is tagged as an audible in the selected formation will have a yellow corner. This helps the user know which audibles they have at a glance while browsing plays. What audibles can I change and how many times can I use the feature in a single game? Does the feature work for both offense and defense? Which game modes does Audibles on the Fly work in? Can I save my audible changes? Changes to audibles are saved for the entirety of the game. Once the game has ended, audibles will reset to their default values. Unfortunately, the Madden Development Team did not have the bandwidth to do the work to allow users to permanently save their audibles on a game by game basis. This is a functionality we on the dev team would love to see, and hopefully we can get that built sometime in the future. For now, the most important thing to us was getting the foundation of this new system built and released to the public so the community can begin to enjoy it. Deployed new technology that will help mitigate some of the disconnect issues. If you or your opponent are experiencing a network issue, you will see messaging in the UI letting you know of the problem and will attempt to reconnect you.